The C5555-.5M is a 0.5 meter HD Mini SAS to HD Mini SAS cable (SFF-8644/SFF-8644) with performance of 12.0Gbps per lane. 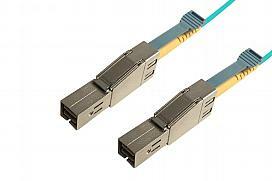 This cable can be used in InfiniBand, SAS and Fibre Channel applications and it is RoHS compliant. It is made with 28awg Madison cable. TAA Compliant.. The C5555-1M is a 1 meter HD Mini SAS to HD Mini SAS cable (SFF-8644/SFF-8644) with performance of 12.0 Gbps per lane. This cable can be used in InfiniBand, SAS and Fibre Channel applications and it is RoHS compliant. It is made with 28awg Madison cable. TAA Complaint.. The C5555-1.5M is a 1.5 meter HD Mini SAS to HD Mini SAS cable (SFF-8644/SFF-8644) with performance of 12.0 Gbps per lane. This cable can be used in InfiniBand, SAS 2.1 and Fibre Channel applications and it is RoHS compliant. It is made with 28awg Madison cable.. The C5555-2M is a 2 meter HD Mini SAS to HD Mini SAS cable (SFF-8644/SFF-8644) with performance of 12.0 Gbps per lane. This cable can be used in InfiniBand, SAS and Fibre Channel applications and it is RoHS compliant. It is made with 28awg Madison cable. TAA Compliant.. 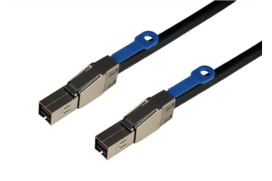 The C5555-3M is a 3 meter HD Mini SAS to HD Mini SAS cable (SFF-8644/SFF-8644) with performance of 12Gbps per lane. This cable can be used in InfiniBand, SAS and Fibre Channel applications and it is RoHS compliant. It is made with 28awg Madison cable. TAA Compliant.. The C5555-4M is a 4 meter HD Mini SAS to HD Mini SAS cable (SFF-8644/SFF-8644) with performance of 12.0 Gbps per lane. This cable can be used in InfiniBand, SAS and Fibre Channel applications and it is RoHS compliant. It is made with 26awg Madison cable. TAA Compliant.. The C5555-5M is a 5 meter HD Mini SAS to HD Mini SAS cable (SFF-8644/SFF-8644) with performance of 12.0 Gbps per lane. This cable can be used in InfiniBand, SAS and Fibre Channel applications and it is RoHS compliant. It is made with 24awg Madison cable. 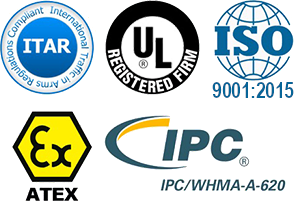 TAA Compliant.. The C5555-6M is a 6 meter HD Mini SAS to HD Mini SAS cable (SFF-8644/SFF-8644) with performance of 12.0 Gbps per lane. 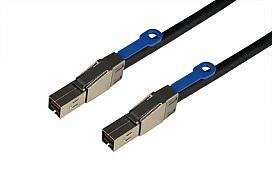 This cable can be used in InfiniBand, SAS and Fibre Channel applications and it is RoHS compliant. It is made with 24awg Amphenol cable. TAA Compliant..
HD Mini SAS - HD Mini SAS (SFF-8644/SFF-8644), Economy, LSZH, 1M, 12Gb/S, Leoni Cable. HD Mini SAS/HD Mini SAS (SFF-8644/SFF-8644), Economy, LSZH, 2M, 12Gb/S, Leoni Cable. HD Mini SAS/HD Mini SAS (SFF-8644/SFF-8644), Economy, LSZH, 3M, 12Gb/S, Leoni Cable. HD Mini SAS/HD Mini SAS (SFF-8644/SFF-8644), Economy, 5M, 12Gb/S, Leoni Cable. Please note, our 5M is not LSZH..